TimeMap: The TimeMap object has references to the GMap2 object (as "map") and the Timeline object (as "timeline"), which you can access directly (e.g. 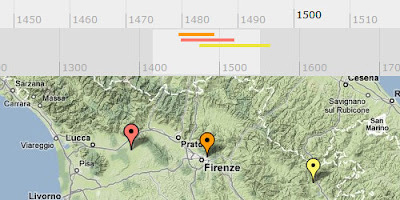 myTimeMap.map.zoomIn()). 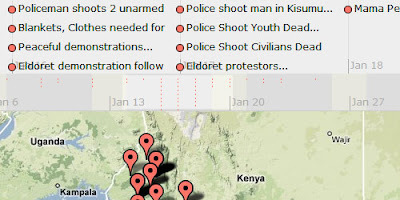 It also has an array of TimeMapDataset objects. 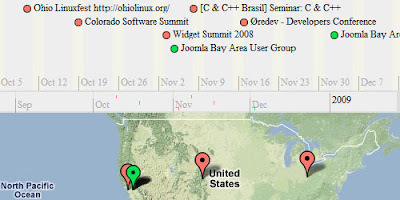 TimeMapDataset: A TimeMapDataset object holds an array of TimeMapItems. TimeMapItem: A TimeMapItem has references to a placemark (on the map) and an event (on the timeline). Calling methods on the item allows it to control the placemark and event so they work in sync. This tiered structure of references means we can set functions or event listeners on one object that make things happen in another - e.g. hiding placemarks on the map when their associated event scrolls out of view on the timeline, or opening a map info window when the corresponding timeline item is clicked. It also means that you can set cascading options on the whole TimeMap, a single dataset, or a single item - for example, you can set a theme on a dataset so that all its items display the same way. The other big thing the library does is handle initialization. The timemapInit() function lets you create your TimeMap and load your data in a single function call, setting all the parameters in JSON. To make this really flexible, it supports a bunch of pluggable function hooks. For example, there's a default openInfoWindow() function called when you click the placemark or the event - but you can write your own function (e.g. to use ExtInfoWindow) and set it on a per-dataset or per-item basis. If all this piques your interest, check out the BasicUsage wiki, svn checkout the code, and get started making your own TimeMap. Happy coding!